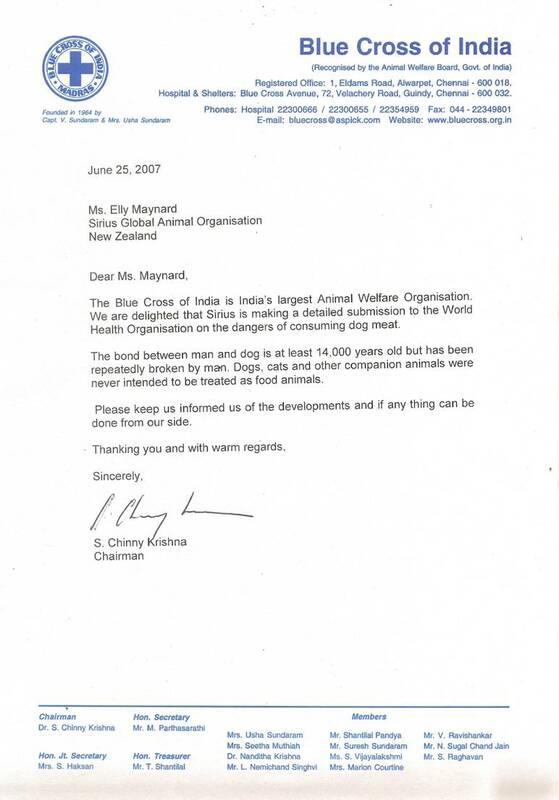 In November 2006, Sirius Global Animal Charitable Trust embarked on the preparation of a Submission aimed at getting dogs out of the human food chain. We have long known that campaigning on its own would not be enough. 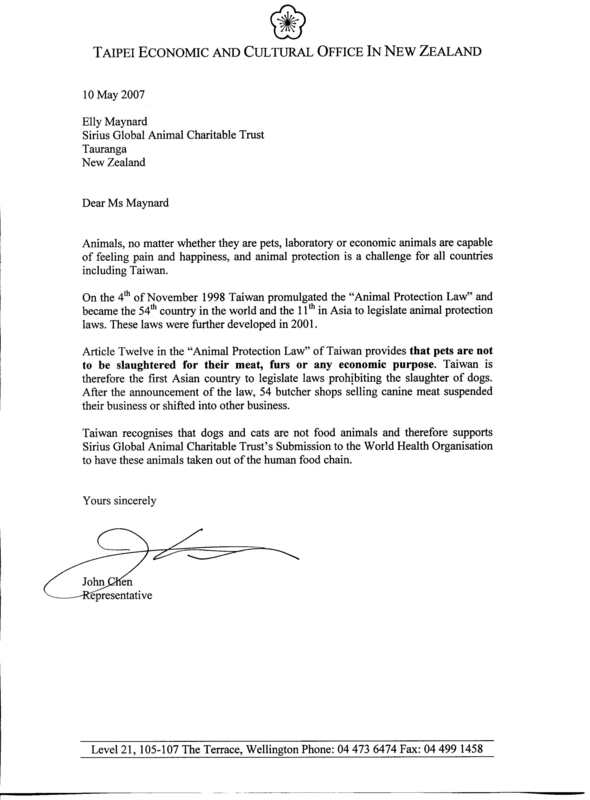 The Submission showing the dangers of consuming dog meat has now been completed and received by the World Health Organisation and the Food and Agriculture Organisation of the United Nations in September 2007. Our aim, as it always has been, is to have the dogs formally classified as not for human consumption. As far as we are aware, no document of this type has been produced before so it is a unique situation. We have worked with Colleen McDuling, BSc(Med)(Hons), MSc(Med.Sc) Scientific Advisor to Sirius to create a document which we feel is invaluable to having dogs taken out of the human food chain. Formal letters of support for the Submission have been obtained from the Governments of Taiwan, New Zealand, India, and Victoria, Australia. These Government letters are invaluable and to have received formal support for this campaign was a victory in itself. 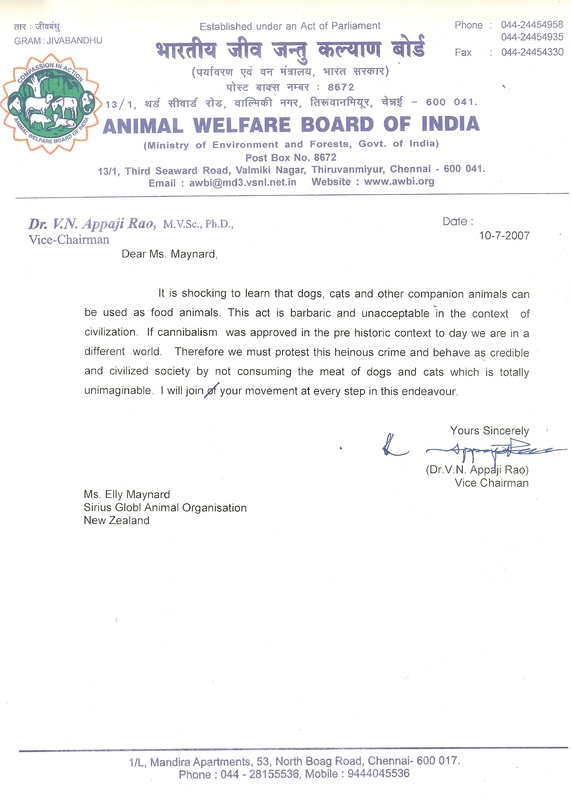 At no other time have Governments formally recognised the plight of the dogs. Support was also received from Dr S.Chinny Krishan, Blue Cross of India, OIPA, Dr Andre Menache and Dr John Weddelburn, Asian Animal Protection Network. A report in support from the Centre for Disease Control and Prevention (CDC) was also attached. The Submission is made up of scientific evidence and documented cases of death and illness caused through consuming dog meat. While the Submission was many months in preparation it is indeed a formidable document. We have put the Submission and attachments on this page as read only documents. Anyone wishing extracts can feel free to contact me at conectus@enternet.co.nz. It has been an honour and a privilege working with Colleen McDuling and Professor Paul Tacon (BA Hons, MA, PhD), a United Nations Representative for Sirius who is greatly thanked for the many hours of proof reading. A full list of the support we have received is included in the Submission. We will keep you abreast of developments on this web page. The following documents are presented as pdf files. You may need the free download of Adobe Reader to view them.